Much remains unanswered as cleaners work to return the statue to its untarnished splendor. 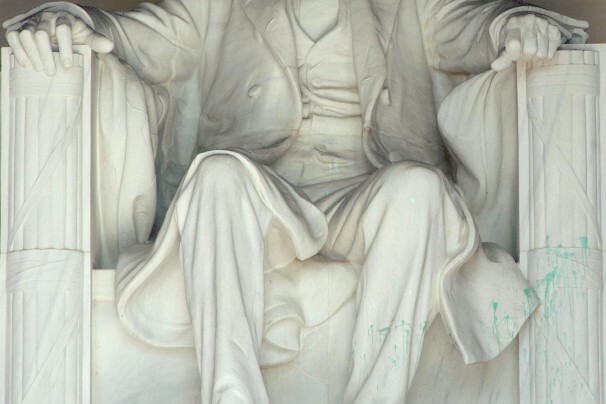 It really is horrible that someone felt it was important, or funny, or significant at all to just splash paint on the Lincoln memorial. I believe graffiti can be a legitimate form of protest (though illegal), but if you’re going to do it, make sure you have a message and that it’s clear. This is none of those things. Many people equate flag burning with anarchy or hate for all things American, and therefore wonder how such a thing could be legal. (P.S., it is legal and protected free-speech and has been since 1990. Here’s an little round-up of a history of flag desecration laws as a reference). Again, this defacement seems so extremely petty and pointless. In contrast, protesters at “World Can’t Wait” in D.C. in 2006 created a “Corporate America” flag and burned it in order to send a message that the part of the nation that is bought out to corporate interests at the expense of the people should be burned away like chaff. I think people gasp at flag burning because they venerate the flag in a way that nears worship. Similarly, the defacement of the Lincoln memorial strikes a nerve in people that echoes in their bones like blasphemy, or heresy does. As a historian, and a Christian, I’d really love Lincoln to be put in his place. He was a brilliant leader, ripe for his time, who had many, many faults and was merely a man. We can learn from the events around his presidency both in positive and negative terms. Vandalism like this is stupid and pointless, but once it’s cleaned up we can move on.